Hello Parents and Pre-K-Grade 3 Teachers! Children love to say the alphabet in Spanish and when they get good at saying it, they love to show off! Practice saying the alphabet with your children. Take your time with this lesson and spread it out over a few days or weeks, depending on how often you have "Spanish Time" in your home. Let's get started! 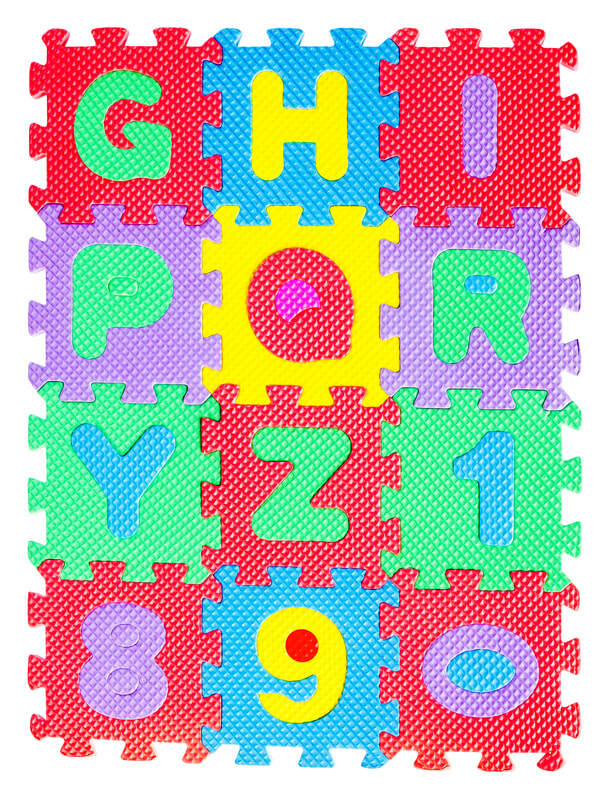 8 1/2 X 10 alphabet poster. 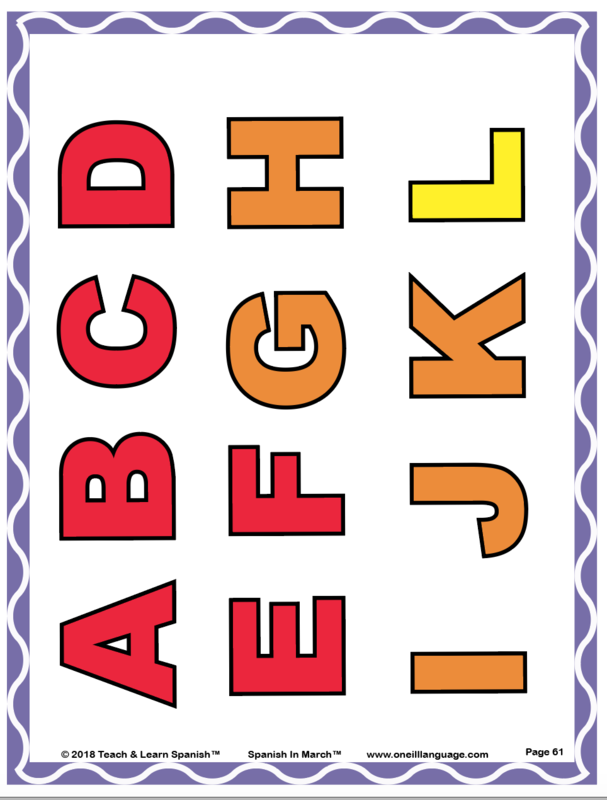 Click on the blue buttons below to download and then print each visual of the alphabet. 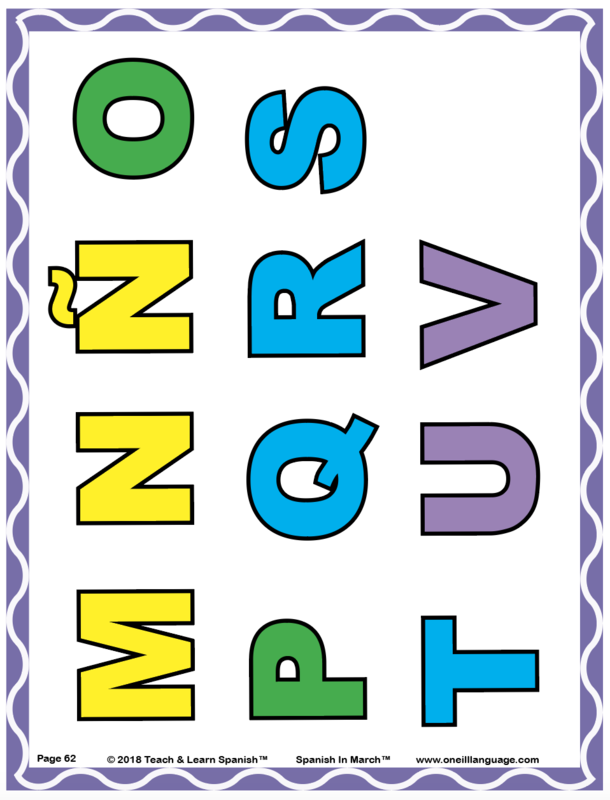 If you don't have a printer you can use the alphabet poster pictured below. The Parent Learning Video teaches you how to pronounce the alphabet in Spanish. You want to become familiar with how to pronounce the alphabet before teaching it to your children. As you're watching the video, look at the page entitled Activity 10 Pronunciation. This page is your "cheat-sheet". See the pronunciation key for each letter. Read it as though you're reading English and your pronunciation of the letters in Spanish will be really good! Be sure to stress any syllables that are underlined. I try to make everything as simple as possible when it comes to families learning Spanish! After you're comfortable pronouncing the alphabet in Spanish, watch the Parent Teaching Videos which walk you through how you're going to teach the alphabet to your children! 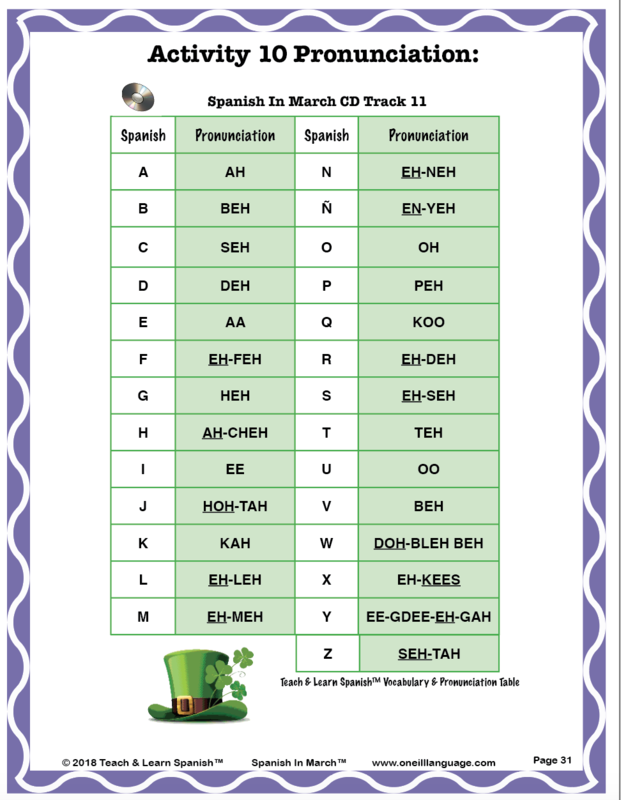 Tell the kids that they are going to listen to and repeat the Spanish alphabet. Play the audio file above. Point to the letters in the alphabet as they are pronounced and encourage your children to repeat them. Once your kids get good at saying the alphabet, let your children take turns take over and being the pointer. If you have a wand or a pointer of some kind it will make the activity more exciting, especially if the your children get to use it! Your children will love watching the video because our friend "Pollo" which means "Chicken" in Spanish sings and dances to the alphabet song. Your children may ask to watch this silly video more than once! 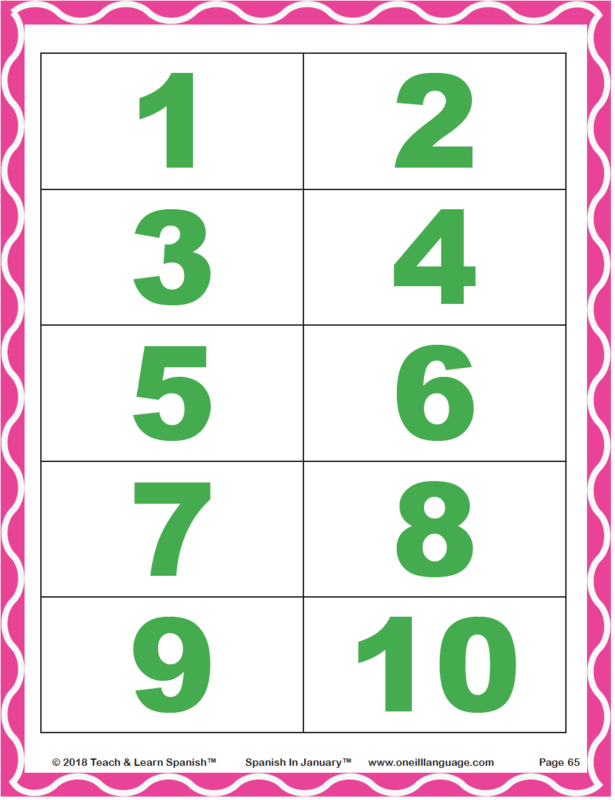 Make several copies of the 8 1/2 X 10 alphabet poster. Tape one copy on your refrigerator so you'll practice saying the alphabet while you're making dinner and spending time in the kitchen together. Keep another copy on your child's bedside table and practice the alphabet at bedtime. Keep another copy in your car and practicing the letters while driving to and from places. If you can, laminate the copies so they will last longer! Show the Spanish alphabet to your kids. Tell them that there is one more letter in the Spanish alphabet (27 total) than in the English alphabet (26 total). See if they can spot the extra letter! (It is the "Ñ", pronounced "en-yeh"). Most homes have alphabet books like the one in the picture to the right. Even if the book is in English, you can use it to practice letters in Spanish. Just point to the letters and say them in Spanish with your kids! Or you can turn this into a bilingual activity and have everyone say the letters in English followed by Spanish! Let a student be "the Spanish teacher" and hold the book! Each time you toss the ball back and forth, say the next letter in the alphabet. Can you make it to the end of teh alphabet without the ball touching the floor? Blow up a balloon and tap it back and forth while saying the next letter with each tap. 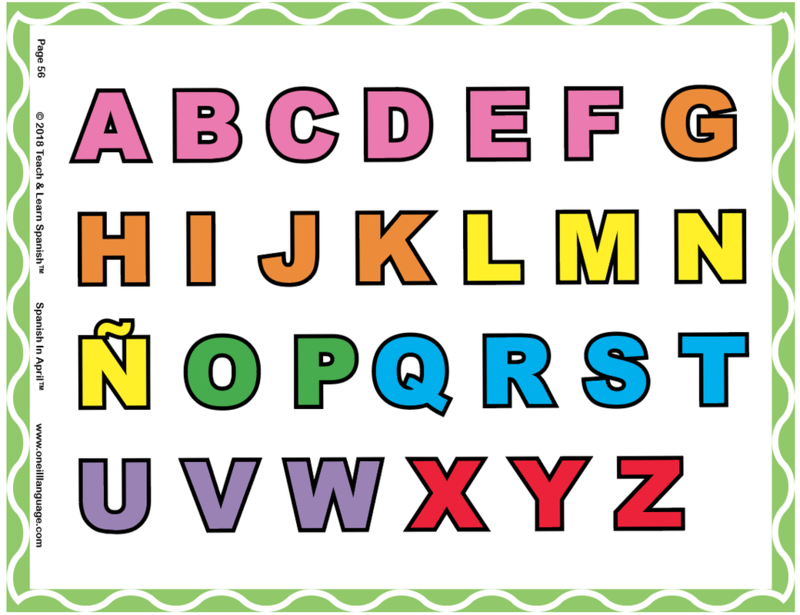 Can you say the entire alphabet in Spanish without the ballon touching the floor? If you have younger children teach them how to gently tap the balloon before playing the game. P.S. Kids LOVE this game. Tapping a balloon adds a new excitement! You will need a copy of the alphabet strip for this activity. Slow down the pace a bit and focus on your kids mastering one color-coded section of the alphabet at a time. Begin by laying the red letters A-F on the floor for all to see. Give the children bingo chips or some kind of token. For tokens you can use Cheese-Its (as I did in the teaching video), Cheerios, Legos or anything else you think they would like. Call out a letter and a child's name. That child must put a token on the letter that you call out. When all of the letters have a token on them, name the letters again but this time let the kids take turns taking the tokens off of the letters and eating them if they are food. When you think the kiddos are ready, repeat this fun game with the other color-coded sections of the alphabet.